(Courtesy photo) An artist rendering of Punch Bowl Social's new Salt Lake City location. The eat-drink-play concept is set to open in The Gateway in June 2019. Punch Bowl Social — one of the country’s hottest eat-drink-play concepts, where one can enjoy a fried bologna sandwich, sip a spirited fruit punch and then challenge friends to a game of darts or shuffleboard — is coming to Salt Lake City. On Wednesday, the Denver-based company announced that it would open its 15th location at The Gateway, 6 N. Rio Grande, in June 2019. Punch Bowl, which plans to get a bar license from the Utah Department of Alcoholic Beverage Control, will be housed in the former Barnes & Noble bookstore at the north end of the downtown development. (Rachel Molenda | The Salt Lake Tribune) Barnes & Noble, pictured here on May 10, 2018, at The Gateway in Salt Lake City, shortly before the store closed. While it’s similar to Dave & Buster’s — another Gateway tenant — officials say these new-generation “eater-tainment” businesses are complementary. “Dave & Buster’s is geared toward families,” said Jenny Cushing, vice president of leasing for Vestar, Gateway’s owner. Punch Bowl, she added, is popular with those in their 20s and 30s. Earlier this year, Nation’s Restaurant News listed it as one of the Hottest Concepts of 2018. At least in Utah, there is another difference: Punch Bowl guests will be able to carry their drinks from their tables to the gaming areas, which state law allows in bars. Dave & Buster’s has a restaurant license from the DABC, which requires patrons to consume an alcoholic product only if they are seated at the table, counter or bar structure. With Punch Bunch Bowl’s arrival, The Gateway takes another step away from its shopping mall roots, said Cushing. In recent years, it has focused on becoming an urban destination by offering a mix of food, beverages and entertainment while also serving as a hub for technology and creative office spaces. Punch Bowl Social will be the third bar at The Gateway, behind Bout Time Pub and Grub and the soon-to-open Seabird Bar and Vinyl Room. Seabird will be near its sister business — La Barba Coffee — on the second level overlooking the Olympic Fountain. 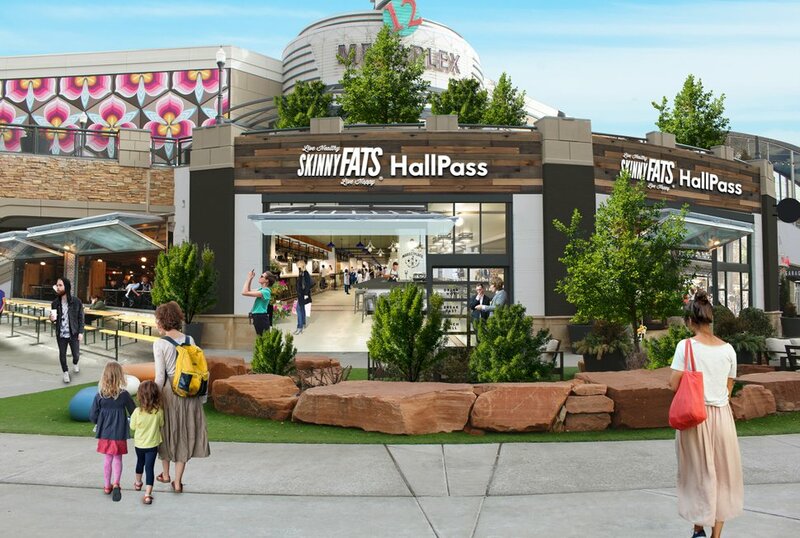 (Courtesy photo) An artist's rendering of the proposed SkinnyFats Food Hall coming to The Gateway in the fall of 2018. Cushing said a food hall will open in May 2019. It will include several vendors, including SkinnyFATS, a rapidly growing Las Vegas-based restaurant, and Stemless, a beer and wine bar. The hall will be at the south end of the center near other restaurant offerings. The Gateway also has announced it soon will bring in The Store, a Utah-based fine-foods grocer. Details of that project and location are pending. The Gateway already is home to an array of entertainment experiences, including Wiseguys Comedy Club, The Depot music venue, Clark Planetarium and Megaplex Theatres. Thompson said the company recently developed a more compact design to make it financially feasible to open in retail, shopping and dining developments in smaller U.S. cities. Punch Bowl’s Salt Lake City site will be 15,000 square feet, compared with the usual 25,000 square feet. While the newer design occupies less space, Utah guests 21 and older will still get all the same amenities, he said, including a made-from-scratch menu developed by celebrity chef Hugh Acheson; craft cocktails and the namesake punch bowls; as well as games such as bocce, darts, shuffleboard, ping-pong, Skee-Ball, rollerball (bowling with a smaller ball and shorter lanes) and karaoke. The website describes the Punch Bowl ambience as “dirty modern,” with comfortable chairs and eclectic décor. At the Salt Lake City location, look for accents from Greek mythology (a nod to the 2002 Winter Olympics the city hosted) and classic TV in honor of Utah inventor Philo T. Farnsworth.